Emotional eating is a very common thing when you’re stressed out to the bone. It’s a way to feel comfort when everything feels off. We all do it to some extent. But, when your stress becomes chronic, reaching for a bag of chips or pint of ice cream every time can lead to health problems. And eating foods high in sugar can actually make your stress worse. It gives you a brief moment of relief, but then you’re left feeling guilty and sluggish from eating foods that don’t provide sustainable energy. And when you’re stressed, eating the right foods can go a long way. You’ll have more energy to deal with your problems, and eating right is a proper form of self-care. Practicing self-care more often will result in a boost in confidence and learning more about yourself. This is the ultimate power salad that will help reduce your stress levels. The mix of spinach, avocado and strawberries will keep you feeling energized and you won’t crash! This will give you energy for the rest of the day and will prevent hunger pains. Quinoa is a complex carbohydrate (the good kind of carbs!) and a complete protein. This means it helps level out your blood sugar and energy. Two things that can easily influence stress levels. Sweet potatoes are also great for your blood pressure and heart. Mixing these two foods together provides a healthy meal that is good for your waistline and your stress levels! Avocados are full of Vitamin B, which is great for lowering stress levels! If you have a Vitamin B deficiency, there are studies that link to anxiety. Avocados are also high in monounsaturated fat (the good kind of fat!) and potassium, which helps lower blood pressure. This recipe takes less than ten minutes to put together, so give yourself some time in the morning to eat this powerful breakfast. Blueberries are rich in antioxidants and Vitamin C. Two things your body needs when you’re stressing out or anxious. Plan the night before and make a few batches of these yummy overnight oats. These energy balls pack a punch, and they are a great snack for an afternoon slump. The walnuts reduce blood pressure and lower feelings of anxiety. These are also a great option if you’re craving something sweet. Instead of grabbing a candy bar, try these out. This will give you the right type of energy that will last throughout the afternoon, and won’t spike your blood sugar levels. There are a lot of benefits to eating asparagus, but especially to help with stress levels. Asparagus helps fight back against those crazy hormone levels and will stabilize them. Which means your mood will even out. Asparagus contains folic acid, which helps produce serotonin. And serotonin calms you down. Instead of drinking a third cup of coffee in the afternoon, try out this refreshing Matcha green tea. Green tea helps you relax and balances your mood. Which is the complete opposite to what coffee does! Green tea still contains caffeine, which can help improve your concentration and wake you up. You won’t get the jitters from drinking green tea, which is a win win. You already know the benefits of blueberries. Reported eating 2 yogurts a day reduces stress and increases decision making. Eating yogurt has many other benefits, like improving your gut health. Which, most likely is what helps improve your overall mental health. There are many reasons to include salmon into your diet, and reducing stress is one of them. The omega-3 fatty acid help counteract stress hormones and lower adrenaline. This is when you can really satisfy your sweet tooth. Dark chocolate helps reduce cortisol levels and is rich in antioxidants. Eating dark chocolate every day can help relieve stress and gives you a reason to eat some chocolate without feeling guilty. Whether you’re dealing with chronic stress or have a stressful event coming up, eating these foods will help reduce your overall stress. When we get stressed, we tend to turn to comfort food to make ourselves feel better. But, there are a lot of healthy options out there that are just as good as the comfort food options. Work on bringing these foods into your diet, and improve your stress levels. 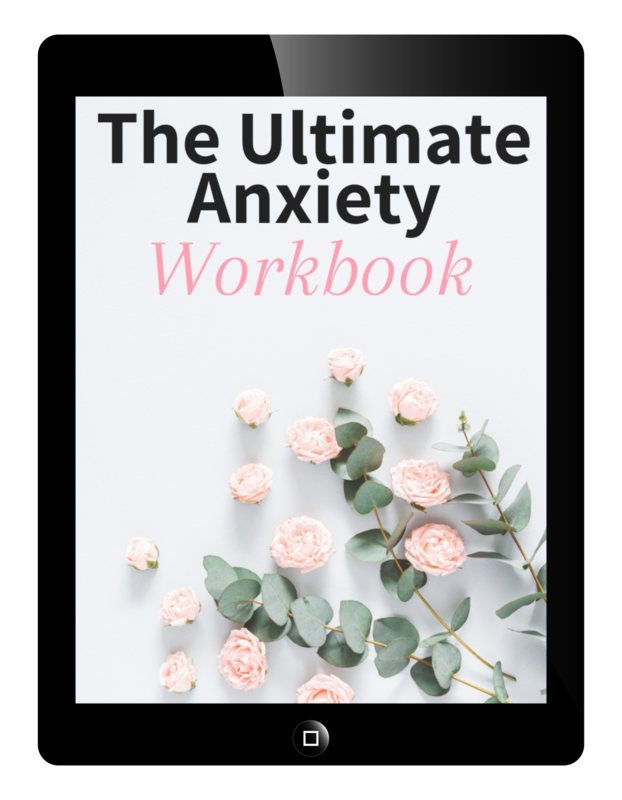 This workbook includes 7 printables to help put you on the path towards reducing anxiety!